Modern Mantel Nativity describes the birth of the Christ child with graceful simplicity. 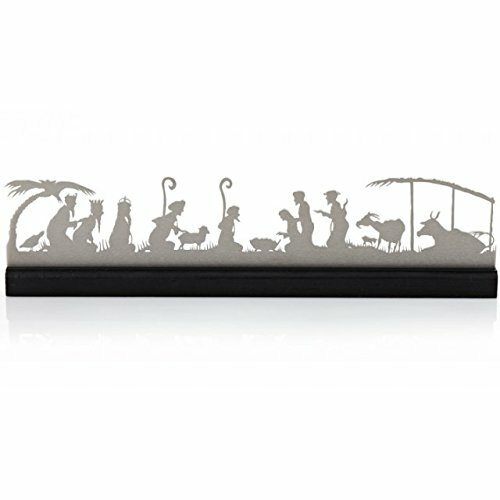 In one horizontal view using silhouettes of the familiar figures of the Christmas story, Valerie creates an original art piece made of laser-cut steel plated with polished nickel and a wood base. Modern Mantel Nativity features nativity characters such as, wise men, Joseph, Mary, shepherds, goats, cows, chickens, and donkey look on reverently towards the baby Jesus paced symbolically in the middle. This creative Christian art piece conveys the true meaning of Christmas. This eye-catching, modern creche is perfect for your home or collection and can be easily stored flat for future years. It is a great nativity for small spaces and is a cinch to set up and take down. It arrives beautifully packaged in an exquisite gift box and protective pocketed cloth that can also be used for display. Valerie Atkisson loves nativities from all over the world and collects them, but she never found one that was made in the USA that looked really good in her contemporary home, so she came up with a similar cross design in paper first as a Christmas card then started making them out of metal for an high-end heirloom nativity set. Valerie loves to tell classic stories in a style that resonates with contemporary decor. There are strong symbolic and conceptual elements in her handmade designs that elevate the utilitarian or decorative object to realm of art. Valerie's products are made in the USA. All materials made from recyclables and services are locally contracted whenever possible. To clean: Wash with a soft, damp cloth and mild soap or rub with abrasive steel wool. No room? It is perfect for nativity apartment dwellers or those who do not have extra room for nativities.